The Meat of Champions (キング肉?, lit. : "King Meat") is a treasure in Pikmin 2 and is actually just a thin slice of ham. It is found on the last (6) sublevel of Glutton's Kitchen. Various Breadbugs along with a Giant Breadbug will try to get this treasure along with other various items, so ridding the area of them is imperative. The Meat of Champions being analyzed. 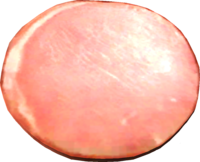 A ham steak from the real world. This page was last edited on December 12, 2018, at 08:29.